Praised to death by critics and fans alike Pan’s Labyrinth has become the If You’re Feeling Sinister of the movie world. Both of these may be great works, but the febrile twee hysteria that has greeted them is enough to put anybody off. At least in the case of Belle and Sebastian, that album is truly their most accomplished. Not so in the case of Guillermo del Toro’s Pan’s Labyrinth. Over the last fourteen years the Mexican writer/director has alternated Hollywood money-spinners such as Blade II and Hellboy with more personal works – Cronos (1993), The Devil’s Backbone (2001) and last year’s Pan’s Labyrinth. With these three films del Toro has created a world of poetic horror that has revitalised conventional genres – the vampire myth in Cronos, the ghost story in The Devil’s Backbone, the fairy tale in Pan’s Labyrinth. What makes the films so compelling is not simply their inventiveness, but the fact that, just like Asian film-makers Ji-woon Kim (A Tale of Two Sisters) and Oxide and Danny Pang (The Eye), del Toro is not interested in cheap thrills or mindless gore but in the creaky doors that a horror tale can open onto the darkest corners of human life. While Cronos, The Devil’s Backbone and Pan’s Labyrinth each take on different figures of the horror canon, there is a striking unity in the worlds they create. All three are Gothic-tinged fairy tales, with a child’s painful initiation to death at their core. In Cronos Aurora silently witnesses her undead grand-father’s decay. 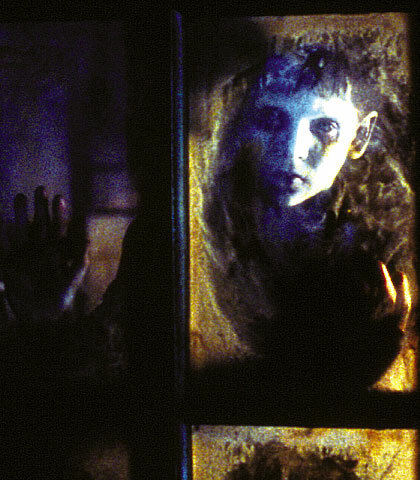 In The Devil’s Backbone Carlos has to face his fear of a young boy’s ghost. And in Pan’s Labyrinth Ofelia has to perform a series of magic tasks to be re-united with her father, the king of the underworld. All three films unfold in the nebulous zone between life and death. All three convey the acute sense of loss felt not just by the living but also by the dead, by the orphan but also by the vengeful ghost, by all those who find themselves brutally thrown on either side of the impassable divide. ‘What is a ghost?’ someone asks in The Devil’s Backbone. ‘A tragedy condemned to repeat itself again and again.’ It is that tragedy that del Toro’s films narrate, again and again. In all three films del Toro creates an in-between world that straddles fantasy and reality. Cronos’ vampire story irrupts into the daily life of an ordinary Mexican family, The Devil’s Backbone‘s ghost story is set in an orphanage during the Spanish Civil War while Pan’s Labyrinth returns to that historical period, alternating between the Franquist/Republican conflict and the Faun’s fairy tale world. Poised between magic and rationality, del Toro’s world has an exquisite ambiguity, brilliantly illustrated in a scene from The Devil’s Backbone. Its young hero Carlos, looking for reassurance after a night of frightful ghostly manifestations, enters the office of the orphanage’s doctor, the kindly Dr Casares. Lined with shelves filled with jars of deformed foetuses, this is not exactly the most comforting of places. Nor is Dr Casares’ response reassuring, as he warns Carlos against superstition. Pointing at the gruesome jars, he gently pokes fun at the locals who buy the liquid in which the foetuses are kept in the belief that it will cure everything. ‘If you believe in ghosts, you must drink some of this’, he tells Carlos. Understandably spooked, Carlos runs away. Once alone, Dr. Casares drinks the liquid from the jar he’s holding. Humorously deflating scientific certainties, del Toro depicts a rational world that is just as dark and disturbing as Carlos’ nightly encounters with the supernatural, the preserved foetuses belonging to the same unsettling realm as the ghost. Each time the realistic background chosen by del Toro features a political confrontation – Mexico’s fraught relationship with the United States in Cronos and the Spanish Civil War in The Devil’s Backbone and Pan’s Labyrinth. Yet, del Toro has clearly very little interest in politics. While much has been made of Cronos as an allegory for the United States’ vampiric relationship to Mexico, the plot itself doesn’t really support this. And in the two Civil War films the fantasy world, being only loosely connected to its historical setting, offers no insights into the conflict. But Del Toro’s choice of setting is far from gratuitous: these dramatically charged situations set the stage for the urgent life and death choices that face the characters. Beyond that, what draws del Toro to these conflicts is that they are moments when reality in all its darkest excesses comes closest to nightmare: the monsters of fascism are as unlikely, as sinister, and as real as the terrifying creatures of childhood imagination. This idea is also at the heart of Víctor Erice’s masterful Spirit of the Beehive (1973) and it is impossible not to think of this film in relation to del Toro’s work. Set in 1940 rural Spain, it subtly evokes the dreamy world of a child faced with death and the unseen horrors of the Spanish Civil War. Confined by censorship, it uses the occasion of a screening of James Whale’s Frankenstein in the village to elliptically explore the anxiety and trauma caused by the war. Acknowledged by del Toro as an influence, it is a film whose quiet suggestiveness and nuanced poetry touch places that del Toro’s baroque opulence can never reach. This is not to detract from del Toro’s achievements for he has built a magnificent world. But the comparison with The Spirit of the Beehive reveals his weaknesses, which are most visible in Pan’s Labyrinth. In that film, unfettered by financial constraints, del Toro’s exuberant enthusiasm is allowed to run free, recreating his visions in their most literal, florid details. As a result, there are so many fanciful creatures, fabulous caves and extravagant monsters that there is no room left for the audience’s own reverie. This is why Pan’s Labyrinth, the most lavishly produced of del Toro’s personal films, is also the least affecting of the three, both emotionally and intellectually. And if it is the one that has been hailed as a masterpiece, it may be because there is some confusion in the world of movie fandom as to what imagination truly is. Magicking up a multitude of bizarre creatures through high-tech special effects or impressive make-up tricks is definitely not what it’s about. And for proof you only need to look at the dismal Lord of the Rings trilogy: it has many weird creatures, all of them rubbish, and the flaccid, pointless world it creates has as much chance of making you dream as a tax return form. I certainly do not mean to place Pan’s Labyrinth on the same appalling level of worthlessness as the J.R. Tolkien/Peter Jackson franchise for del Toro has more magic in his chubby little finger than both of them put together plus the preposterous trilogy piled up on top. But when it comes to imagination, less is definitely more, hence the superiority of Cronos and The Devil’s Backbone over Pan’s overwrought Labyrinth.